Apparently, the crystal popped off Captain Dave Scott's Omega, so he strapped on a back-up watch that he’d brought along. The back-up watch was an American made Bulova, which the watch firm had given to Scott to test. 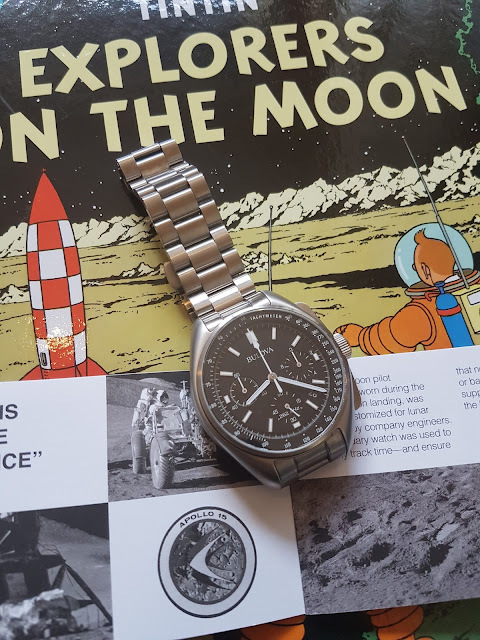 Wearing the Bulova, Scott who walked on the moon's surface and was the first person to operate a lunar rover vehicle. This was an American space mission, with American astronauts and the instrument panel clocks and timekeeping mechanisms were all made by Bulova, yet the watches that astronauts were meant to wear were Swiss. 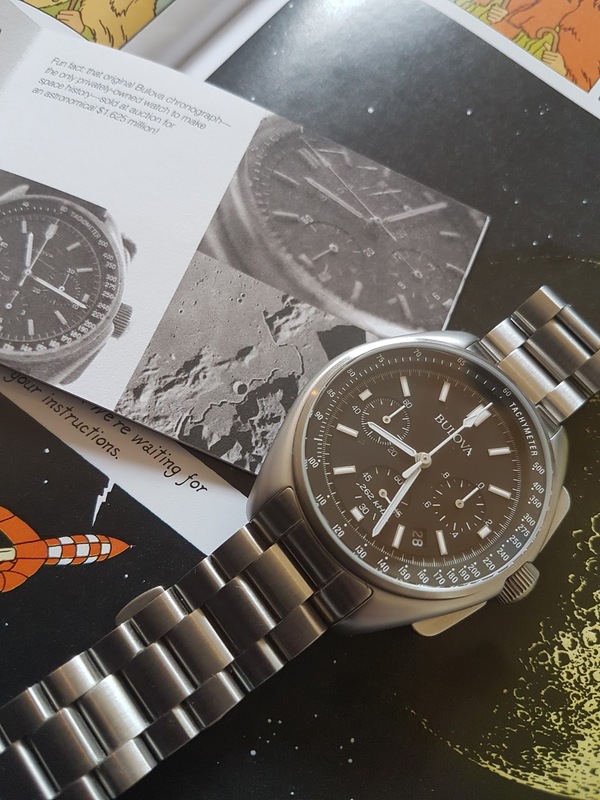 Reading between the lines, I would summise that Bulova were keen to get one of their watches on the moon too, which was why unbeknown to NASA, Scott received a prototype watch to test. Strangely, that was the end of the matter until more than forty years later when Dave Scott was auctioning some things off, including his one-of-a-kind Bulova. This new moon watch was breaking news in the watch world. 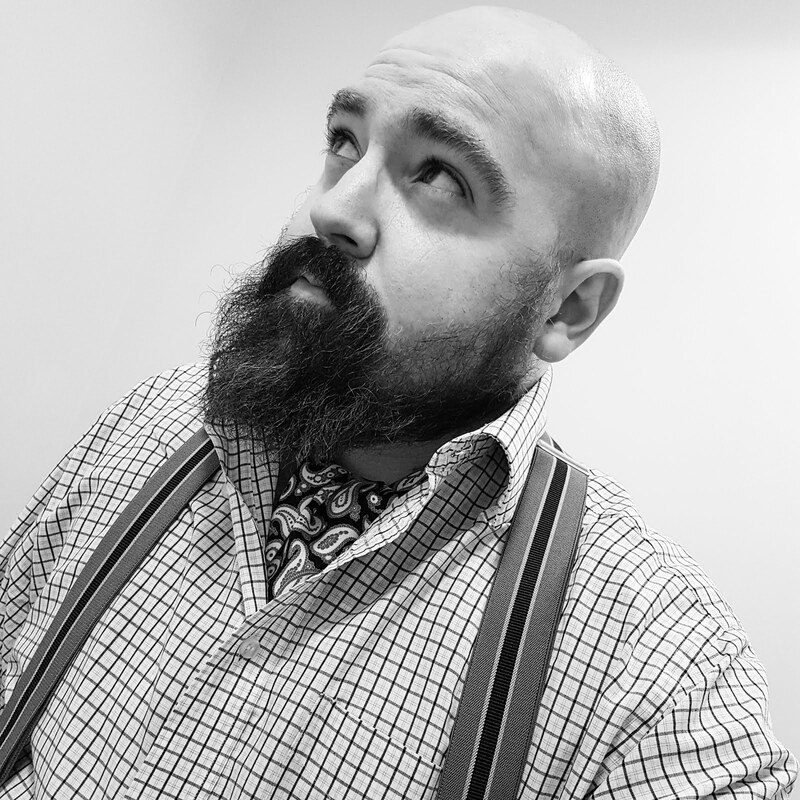 For so long, Omega had shouted from the rooftops that their watch was the only one that had been on the moon and now suddenly, there was a new cowboy in town. Given that NASA own the Speedmaster watches that have been on the moon, the auction for the Bulova was a chance for somebody to own a moon watch for themselves so there was big interest. The watch ended up selling for $1.625 million. 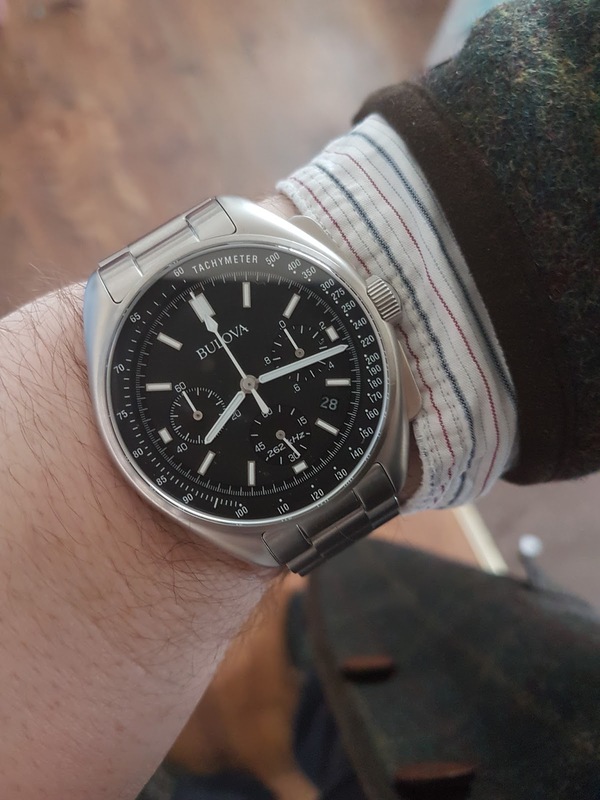 Bulova, now owned by Japanese firm Citizen, very wisely spotted an opportunity and released the Bulova Moon Watch, a faithful recreation of the watch worn by Scott. What’s more, at around ten times less less expensive than the Omega offering, it's more attainable to own. Given my growing interest in adventure, exploring and watches, I simply couldn’t resist so a few weeks ago, I bought myself a Moon Watch. Now I’ll admit, it’s quite large at 45mm. But then, you would expect a watch that has been to the moon to be quite sizeable. In any case, I don’t have skinny wrists so I think the Bulova looks rather fetching on my 7 ¼ inch wrist. 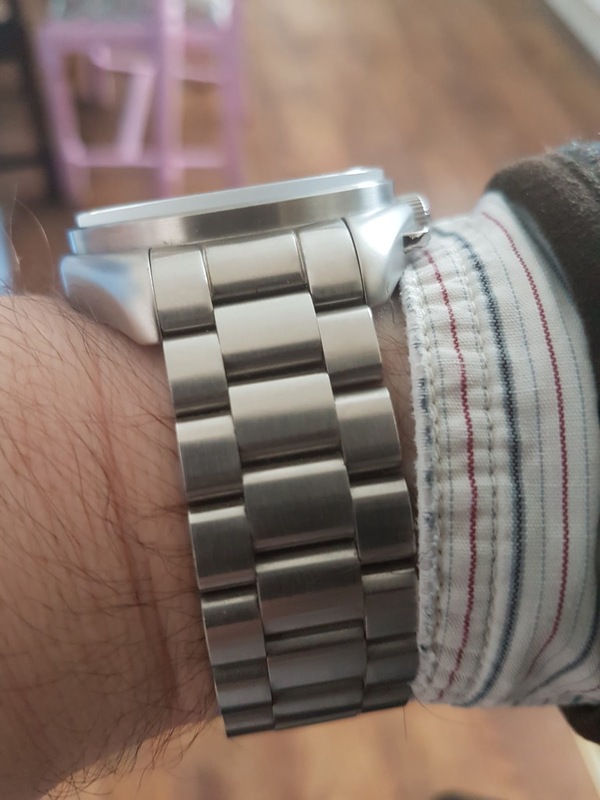 I opted for the steel bracelet version, which is absolutely superb quality and very comfortable on the wrist. It has a butterfly clasp, giving it a little extra security and is almost a mix between an Oyster and Presidential style bracelet. The watch is powered by a ultra high frequency quartz movement which is apparently, the most accurate watch movement in the world. I'm not one of those people that obsess about time down to the hundredth of a second but having just checked the time, it's not lost a minute. 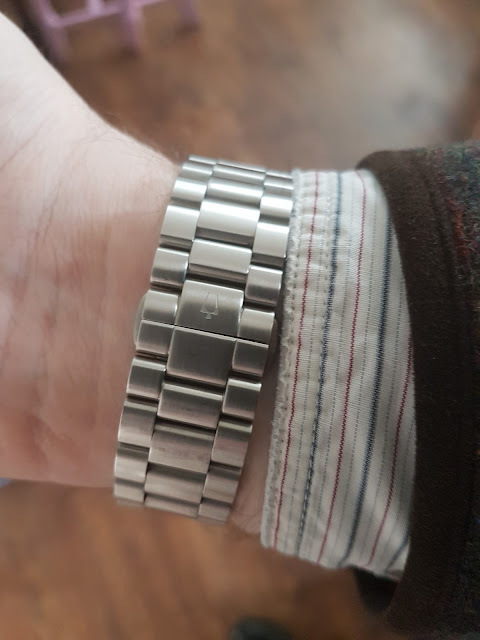 Having had it on my wrist for a month, I find it an absolute joy. The dial is very pleasing. There's something about a black and white dial which is just so clear and legible. It also has different layers, making it very interesting to look at. I'm not usually a particular fan of watches with a date feature but on the Bulova it's very unobtrusive. I also really adore the way the sapphire crystal stands up at the very top. 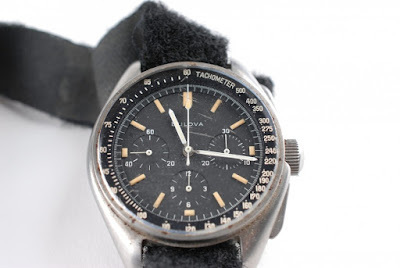 The chronograph pushers are another feature that I like. 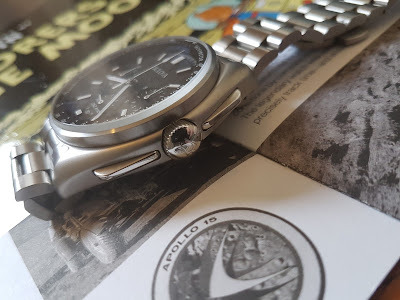 They make a rather nice change compared to the usual two round pushers that stick out of other chronographs on the market. All in all, I'm delighted with my little piece of space history.